At the beginning of the year, I made a New Years Resolution to get rid of all the paper on my desk. Two and a half months into the year, I'm proud to say I haven't had a single single post-it reminder on my desk in all this time! Where did all the post-its go? I eliminated all my paper reminders by finally getting serious about using Microsoft Outlook Tasks. In our business, we use a sophisticated ticketing system to handle all our customer service requests and customer relationship management (CRM). These are great tools for the bulk of my work, but I still ended up with a lot of other "lists". Now, each morning I walk into my office and find a completely clear desk. Here are some of the things I found helpful in Microsoft Outlook Tasks that may help you save time and get more productive too. (1) You can see your tasks listed right in your main Outlook view enabling you to read your email and view your tasks in one place. In Outlook 2010, go to "View", "To Do Bar", and check off "Task List". Your top "to dos" will be right in front of you all the time (if you want!). (2) You can choose a wide variety of "views" of your list - a simple clean "to do" list, or a detailed list with all your completed items crossed off. Sometimes seeing all the completed tasks in one place is a big boost. Choose between "Detailed", "Simple List", and "To Do List". You can sort by status, due date, completion date, and more... try doing that with a piece of paper! 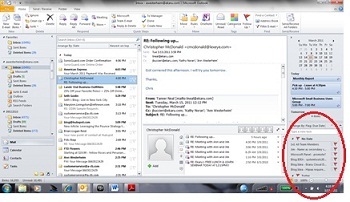 (3) You can track billable time and mileage in Outlook Tasks. Create a new Task, and select "Details". You'll be able to add information for total work, actual (billable) work, mileage and billing information. For solo professionals this could be a great tool without needing to invest in a more sophisticated third-party tool. Since you already have Outlook, see if it works for you. Next time you have a few moments to spare, explore Outlook Tasks and see if there's a way to improve your own productivity.